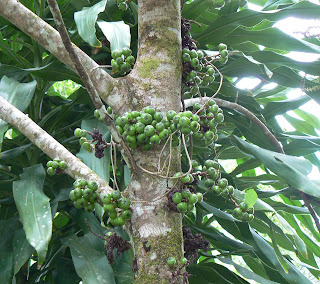 An interesting tree this - it's a variety of Native Fig and we have quite a few around Daintree Valley Haven. The tree grows to quite a height and the figs grow in clusters all up the trunk and along the branches. They are edible when ripe but tend to be quite dry and not very tasty - but the Double-eyed Fig Parrots love them! After another dry spell we're having a few more welcome showers and we're just noticed that our one and only Mangosteen tree (which we thought wasn't going to fruit this year) is suddenly laden with small fruit buds. Mangosteens are totally different to Mangoes - of which we now have a huge crop which is just starting to ripen - yummy! Two of our favourite fruits!